There an old saying about you can't teach an old dog new tricks now I know Lonnie Knowles would be considered an old dog. The baffling, perplexing mysterious thing is how Mr. Knowles pulling this trick off. He is not even average two wins per year over the past 4 years and now he has won two of his first two tournaments. I personally don't believe in magic tricks so let's take a statistical look at what he has done to win each event, it is not his driver he is about 50% of fairways hit and not his iron only 44% greens in regulation, so it must be his short game match up with a red-hot putter, He is two strokes better than the next best putter. Craig Colbert and 5.5 strokes better than the field in the league. Ok that nothing because we are not the pros well Jordan Spieth is the Tour best putter 1.67 per round. Lonnie is rolling the ball at a clip of 1.44 putts per round. Although he has only played in two matches it is still an incredible stat that deserves a pat on the back. 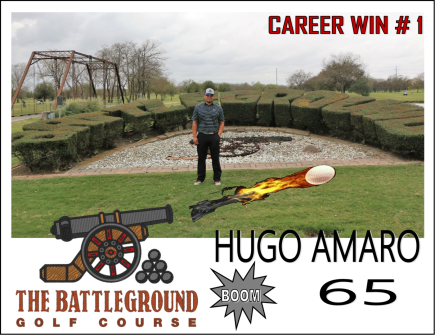 The Battle at Battleground was between just two player Hal Gregory and Lonnie Knowles both players battle the course and high wind extremely well to put the rest of the field in the rear mirrors including Jaime Villarreal who plays Battleground on a weekly basis and pretty much is his living room and Jose Sanchez the 2016 player of the Year. Both Gregory and Knowles each have 7 career wins apiece so this win would be HUGE bring the winner 3 wins behind Villarreal 11. Gregory was down 4 at the turn and really could not gain any ground on Knowles on the back nine. In the clubs house, Gregory posted a 69 that gave Knowles just enough breathing room to play the final closing holes comfortable. Congratulations Mr. Knowles on your win you are moving up to Hall of Fame potential first round ballot. Hugo Amaro did what Jaime Villarreal could not do, he took full advantage of his home course to win his first League victory. His win was very impressive by beating out the B flight hottest player Vincent Gilmore. They went toe to toe for 18 holes like Chavez and Mayweather, Duran and Leonard. They were hitting each other with hay-makers both bobbing and weaving both slipping and grabbing all the way to the 18 hole. Gilmore had a chance to go one up on 16 but missed a three-foot birdie putt. They both double-bogeyed 18 to place them in the clubhouse at seven under two shoots better the third place Anthony Lemon, who had his best career finish since he joined the league last year. Hugo and Vincent went to a scorecard playoff and Hugo placed a 3 on the hardest hole on the course. Giving him his first win of his career. I predict this will not be your only one I see much more to come congratulation on game welled played.